Over the next 10 years, UCF Athletics has targeted nearly $70 million in new construction projects. The UCF Athletics Board of Directors recently accepted an extensive athletics facility development plan, which calls for $70 million worth of construction on campus in the next 10 years. The plan will soon be presented to the UCF Board of Trustees for final approval before the fundraising process begins. The 50,000-square-foot UCF Academics/Athletics Center is to be constructed on the vacant site between the new Wayne Densch Sports Center and residential tower four. The facility will be anchored by an academic support center for UCF’s student-athletes providing computer labs, tutoring and mentoring rooms, and offices for counselors and staff. Office space will also be provided for athletics administrators and coaches. Presently, both Academic Services for Student-Athletes (ASSA) and athletics administration are headquartered in the original Wayne Densch Sports Center, built in 1982-83, on the southern side of campus. Expansion of the UCF baseball complex is slated for construction in three separate phases and will bring an additional 3,380 seats to the present 800 seating capacity. The first phase calls for 1,200 bleacher seats, with 600 seats to be added beyond each dugout. The second phase includes a new elevated press box, seven luxury suites and club level seating. The final phase will add 2,000 seats on the present concourse, along with the addition of new public restrooms and concession space. In addition to a larger stadium, the baseball complex is also slated to include expansion and renovation to the team clubhouse. Included in this project will be upgrades to the playing field, converting the present bench seating to chair-back, adding a canopy for shaded seating and a children’s activity area. 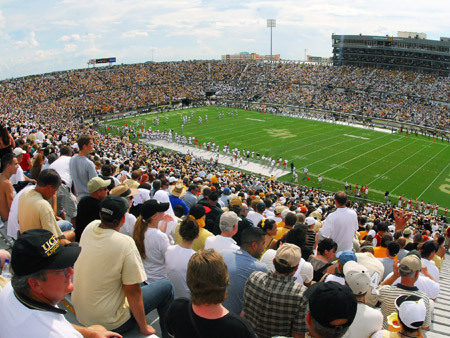 A 1,500-seat stadium located on the west side of the UCF Track and Soccer Complex is projected to be the first project to begin as a part of the facility development plan. The new stadium will contain a press box and public restroom building and will be clad with a red brick and stucco facade. When completed, the complex will have a seating capacity of over 2,000. Adjacent to the current soccer/track complex a 7,500 square-foot clubhouse will be constructed for the track and field and soccer programs. The facility will include locker rooms, meeting space, an athletic training room and equipment storage for these programs. Locker rooms will also be included for visiting teams and officials. The UCF Intercollegiate Tennis Complex, to be built adjacent to the east side of the current UCF Softball Stadium, will include 12 championship-caliber courts and a 1,000-seat grandstand. The new tennis complex will also contain a clubhouse with locker rooms and other amenities for both the men’s and women’s programs. It is also planned that the complex will include three to four covered courts. Expansion and renovation is planned for the Wayne Densch Sports Center, which houses football operations, as well as the main weight room and athletic training center. This 12,000 square-foot addition will be located between the current building and the Nicholson Fieldhouse. Planned upgrades include an expanded football locker room with a student-athlete lounge area, a larger equipment storage room, expansion to the current weight room and additional office space. Expansion to Bright House Networks Stadium is also considered within the 10-year plan. This project would be comprised of two components. The first component would be an addition to the Roth Tower (west side) to provide more suites, club seating and operational space. The second component would be an expansion to the seating bowl by adding 10,000 seats to the east side of the stadium, which would bring the overall seating capacity of Bright House Networks Stadium to over 56,000. The second component may also include an east side stadium club.